(Newser) – Researchers studying invasive Burmese pythons in Florida came upon something they'd never seen before: an 11-foot-long python had consumed an entire deer that weighed more than the snake itself. The AP reports the wildlife biologists tracking the slithery creatures stumbled upon the bloated snake in Collier Seminole State Park, and when they moved the creature it began regurgitating a white-tailed deer fawn. (Photos here.) Biologist Ian Bartoszek told the Naples Daily News that the fawn weighed 35 pounds; the snake 31.5. "We were sitting there just trying to process that an animal this size could get its head around what turned out to be a deer," Bartoszek said. "It's surreal to see that in the field." Bartoszek said it was the largest python-to-prey weight difference he had measured. Burmese pythons, which can grow nearly 20-feet long, were brought to South Florida as pets in the late 1970s. They were released into the wild, and have become a problematic invasive species. 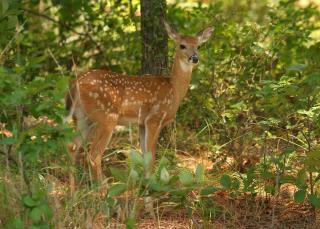 White-tailed deer are an important food source for Florida's endangered panthers, so the researchers are concerned the pervasive snakes could also impact the health of the big cats. If the snake had been left in the wild, it would have digested the entire deer, Bartoszek said. He said the predator-to-prey size ratio stunned his team. "It showed my team and myself what we were actually dealing with out there, what this python is capable of," he told the Daily News. That tagging the males and following them is a good idea. That should help but it's always going to be problem down there in fla......just like the Asian carp in Midwest rivers....emerald ash borers...stink bugs.... pretty much everything that comes from Asia ends up being none too good for USA. I'd be OK with these big snakes if they just ate crooked lawyers, politician, and pedophiles.